Above: Tropical Storm Don as seen by the MODIS instrument on NASA’s Aqua satellite on Monday afternoon, July 17, 2017. Image credit: NASA. A Tropical Storm Warning is up for the island of Grenada, and Tropical Storm Watches are posted for Barbados, St. Vincent and the Grenadines, and St. Lucia as Tropical Storm Don cruises west at 17 mph towards the Lesser Antilles. On Monday afternoon, an Air Force hurricane hunter aircraft found a tight closed circulation and surface winds of 40 mph, prompting the National Hurricane Center to begin issuing advisories for the fourth named storm of the 2017 Atlantic hurricane season. By 8 pm EDT Monday, these winds were up to 45 mph. 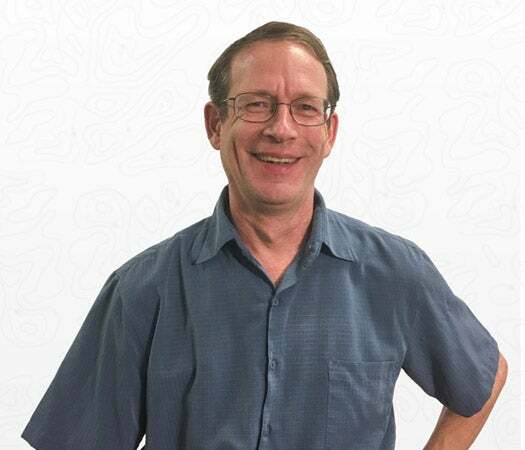 On Monday evening, Don was enjoying light wind shear of 5 - 10 knots and warm sea surface temperatures (SSTs) near 28.5°C (83°F)--about 1°F above the seasonal norm. However, development was being slowed by dry air, thanks to the presence of the Saharan Air Layer (SAL) just to the north. The relative humidity at mid-levels of the atmosphere was a marginal 65%. Satellite images showed that Don was a small storm, with only a modest amount of heavy thunderstorms. Don will continue to move west to west-northwest at 15 – 20 mph through Wednesday, which will bring the core of the storm over the southern Lesser Antilles Islands on Tuesday evening through Wednesday morning. Dry air will continue to interfere with development, and the 18Z Monday run of the SHIPS model predicted that relative humidity at mid-levels of the atmosphere would drop to 55 – 60% by Wednesday. With wind shear expected to remain low to moderate through Wednesday, there is the potential that Don could strengthen to have top winds in the 55 – 60 mph range as it moves through the Lesser Antilles. On Thursday, when Don will be in the Eastern Caribbean, wind shear will rise to a high 25 knots, and the 70 members of the 12Z Monday European and GFS ensemble model forecasts predict that Don will weaken and meet its demise by Friday. However, Don could potentially affect the ABC Islands and make landfall in northwestern Venezuela late in the week before dying. Bret and Don: harbingers of an active hurricane season? We’ve now had four named storms this year: Arlene, Bret, Cindy and Don. The fourth named storm of the year doesn’t typically form until around Aug. 23, based on the 1966-2009 average. 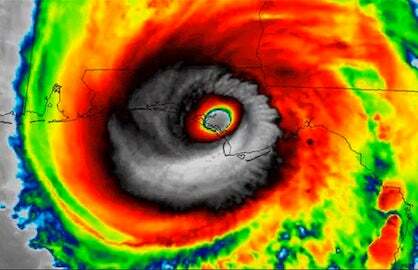 The first hurricane of the year usually arrives by August 10; so far none of this year’s storms have become hurricanes. 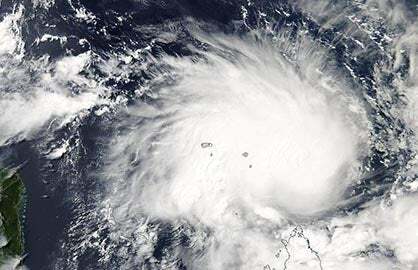 Don is likely to be the second tropical storm to affect the Lesser Antilles Islands this year. According to NOAA’s Historical Hurricanes site, this would be the first year on record for the islands to see two tropical storms before August 1. There were two other years that came close: in 2005, Hurricane Emily passed though the islands on July 14, and the tropical depression that would become Hurricane Dennis passed through on July 4. In 1933, a tropical depression passed though the islands on July 14, and a tropical storm hit on July 25. It should give no one comfort that these were the two busiest Atlantic hurricane seasons on record! Above: A tropical wave in the midlde tropical Atlantic as seen by the VIIRS instrument on the Suomi satellite on Monday afternoon, July 17, 2017. Image credit: NASA. 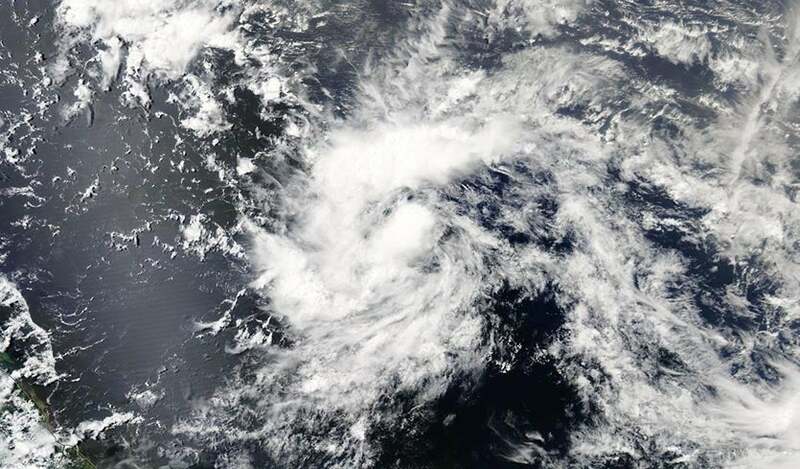 A tropical wave located at 8 pm EDT Monday in the middle tropical Atlantic, about 900 miles west-southwest of the Cabo Verde Islands, was headed west-northwest to northwest at 10 - 15 mph. This wave has a marginal potential to develop into a tropical depression late this week. 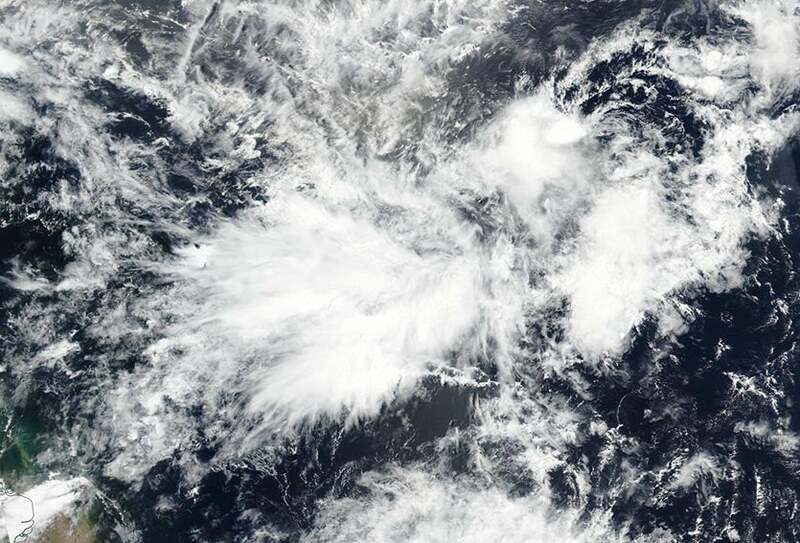 Satellite images on Monday evening showed that the wave was disorganized, with little spin and only a modest amount of heavy thunderstorm activity. Development was being retarded by dry air, thanks to the presence of the Saharan Air Layer (SAL) just to the north. 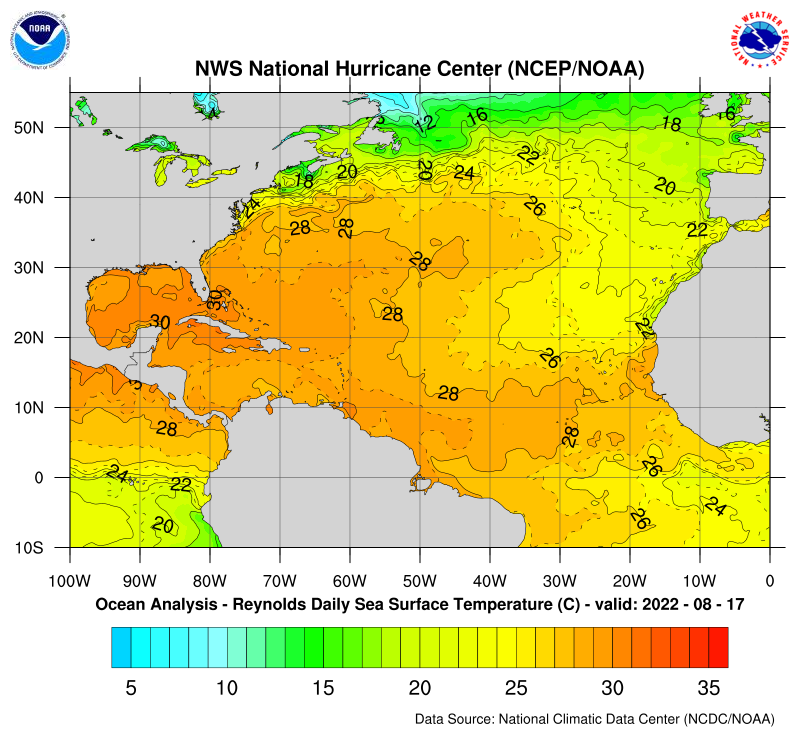 Wind shear was moderate, around 15 knots, and sea surface temperatures (SSTs) were warm enough for development, near 28°C (82°F)--about 1°F above the seasonal norm. There is model support for development of this wave—over 40% of the 70 members of the 12Z Monday European and GFS ensemble model forecasts predicted that the wave would develop into a tropical depression later this week. However, none of these forecasts showed the storm surviving long enough to affect any land areas, as the system is predicted to enter a region with unfavorable conditions for development late this week--in the waters between the Lesser Antilles Islands and Bermuda. In their 8 pm EDT Monday Tropical Weather Outlook, the National Hurricane Center (NHC) gave the wave 2-day and 5-day odds of tropical cyclone development of 20% and 30%, respectively.